This album collects 24 songs from the TV show Carabao The Series, which has aired over the past year. Carabao songs are known for their vivid themes and story-telling. So it is completely feasible that each episode of Carabao The Series takes a famous Carabao song and turns the lyrics into a 40 minute drama. These little soap operas have been, for the most part, well produced, well-acted, and entertaining. I dare say, there are few bands, and probably only one, where the song catalog easily lends itself to such a thing. At the end of each show, a much younger band covers the song of the week in a much younger style. This album complies those fresh covers by Summer Stop, The Jukks, Lomosonic, The Richmond Toy, Tattoo Colour, and more. I love these songs. They are creative tributes to the originals. What style are these bands playing? Well, to this old person of the Carabao generation, they all sound like Scrubb or Paradox, which is wonderful. What style is Scrubb or Paradox? Well nothing exactly equivalent is going in US music right now. These bands do rock that is slick, artsy, and somewhat retro. I have been told by a younger friend that the style is “alternative” but the songs feel way too carefully considered for me to agree to apply that label. Lyrics are performed with great attention to emotional nuance, even in cases where the original melodies are disguised almost out of recognition. The songs, like the dramas, take unexpected turns while still capturing the essence of the featured song of the week. The Jukks’ version of “Lung Kee Mao,” “ลุงขี้เมา” (The Drunken Uncle) is dark and energetic. In this version, Drunken Uncle dies under a bridge, but Nirvana lives! “Made in Thailand” is Bigger and Badder in this heavy metal version by Lomosonic. No pretty flutes this time. “Sanyaa Na Fon,””สัญญาหน้าฝน” (Rainy Season’s Promises) by Tattoo Color, begins in the precious style of a Christmas pop song, then some rock is tossed into the mix at the end. “Telay Jai” “ทะเลใจ” (Ocean Heart) by สมเกียรติ (Som Giat) deviates from expectations even thematically. The lyrics of this song are about the restlessness of youth and how you first have first make peace with yourself before you can be happy. “Telay Jai” is a usually a soothing song that emphasizes the “making peace with yourself” part of the story. But the “Carabao the Series” dramatization of this song explores what happens when you find you CAN’T live with yourself. Similarly, this cover of “Telay Jai” has an anxious undercurrent of clashy cymbols and distortion. The next song, “ถามหาความรัก” (“Asking after Love”) by When has lovely Alicia Keys-like piano. The second side begins with two songs สามช่าคาราบาว “Sam Cha Carabao” and “กระถางดอกไม้ให้คุณ” “Flowers for You” (by Polycat and Tattoo Colour, respectively) that sound to me like theme music from American 70s-era TV shows. I know, its bizarre . . .
“Kon La Fun”(“Dream Chaser”) is a rousing, inspirational song advising people to chase their dream until they hold it in their hand. It has been covered in every which way, and here is done as cool jazz (by Penguin Villa). The words say please go struggle for your life, and the tone says please go relax by the pool. And yet, I LOVE IT! You can do anything to this song, and it’s still amazing because of the lyrics. As you can see, I have a lot of favorites. I will just quickly mention that ราชาเงินผ่อน (“King of Credit”) is done in a Black soul style by Spoonfulz; the cover of “Ba” [about a crazy person] by the Barbies sounds like U2; and the “I love you” in “Hua Jai Ba Bin”“หัวใจบ้าบิ่น” (Tattoo Colour, again) is heart-melting. Young people today . . . wow, they are really talented. 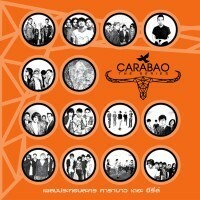 English speakers can BUY THE ALBUM “Carabao The Series”, and all your other Thai music and video at eThaiCD.com. The site is in English and the helpful staff will answer your questions in English.